Even if you take great care of your smile and oral health and invest in over the counter whitening products, your teeth may not be as white as they can be. Everything from diet and lifestyle habits like smoking to genetics, medications, and the normal aging process can lead to dental stains and discolorations. A professional teeth whitening treatment can transform your smile - and take a few years off of your appearance in many cases - in as little as a single trip to the dentist. Dr. Brandon Huang, a dentist in Midtown Manhattan, offers a range of cosmetic and general dentistry services. Over the counter products like whitening toothpastes, gels, and strips can help, but they won't deliver the same results as a professional treatment, and may contain abrasive ingredients that can strip away tooth enamel over time. This will actually make your teeth more vulnerable to staining and discoloration over time. Going to the dentist for a whitening treatment will save you time, deliver significant results, and protect your teeth and gums from harsh chemicals. Who Should Invest in Professional Teeth Whitening Treatments? You don't have to be a professional actor or model to invest in teeth whitening treatments. In fact, studies have shown that a whiter smile is at the top of the wish list for most people, and it's not hard to see why. Statistics show that feeling good and confident about your smile can improve everything from self esteem to personal and professional opportunities. Whether you drink coffee, smoke tobacco (added bonus: whitening your teeth is the perfect incentive to quit), or just want to whiten your teeth a few shades for personal satisfaction, teeth whitening treatments are available for everyone. Nothing ruins an otherwise beautiful and healthy smile like stains and discolorations. But you don't have to live with a less than perfect smile. For more information about professional teeth whitening treatments, contact New York Dental Studio today by calling (212) 588-1809 to schedule an appointment with Dr. Huang. Say goodbye to those embarrassing yellow dental stains. Do stained, dull teeth have you feeling pretty down about your smile? This is where our Midtown Manhattan, NY, cosmetic dentist Dr. Brandon Huang can help. Just a simple professional teeth whitening session may be all you need to breathe new and brighter life back into your smile. Professional teeth whitening is an ideal cosmetic option for patients who maintain good oral health but have yellow stains caused by foods, drinks or aging. Yellow stains respond the best to professional teeth whitening. We will also need to examine your smile to make sure that there aren’t any issues such as receding gums, bleeding gums or cavities. Any active dental problems will need to be treated before getting a teeth whitening treatment. Also, it’s important to know that whitening treatment only works on natural tooth structures and will not brighten dental work such as crowns or fillings. When it comes to whitening your smile professionally there are two options: You can choose to have our Midtown Manhattan, NY, dentist whiten your smile for you right here in our office or you may choose to have us provide you with the materials you need to whiten at home. The choice is up to you. If you are looking for the fastest and most significant results from whitening treatment than our in-office whitening system is the best option. After all, most patients get the results they want in just one hour. Plus, the whitening gel is strong, which means that we don’t have to leave it on your teeth nearly as long to produce amazing results. You’ll sit back while we do the work for you. If you would rather just whiten at home when it works best for you and your schedule then at-home whitening might be the perfect solution for whitening your smile. Some patients also like the fact that at-home whitening is less expensive than in-office whitening. You won’t get results nearly as fast, but you will see results after about one week of continual use. New York Dental Studio in Midtown Manhattan, NY, is here to provide your smile with the cosmetic or restorative dentistry it requires to look and feel its best. If you want to find out if you are an ideal candidate for professional teeth whitening then it’s time to call our office today to learn more. If you could have your very best smile, what would it look like? According to the American Academy of Cosmetic Dentistry, most people want the whitest teeth possible. At New York Dental Studio in Midtown Manhattan, NY, your dentist, Dr. Brandon Huang, makes those smile dreams come true with professional teeth whitening services. Given your choice of lightning-quick in-office whitening, or more gradual at-home treatments, you can enjoy a bright smile that gets noticed. Tooth enamel becomes stained from the inside out (intrinsic stains) or from the outside in (extrinsic stains). Oral injury and some pharmaceuticals (such as tetracyline and chemotherapy) are responsible for those intrinsic and exceptionally stubborn stains. Conversely, extrinsic stains are truly just surface discolorations as organic matter becomes caught in the enamel, the outermost layer of your tooth structure. These discolorations come from tobacco and darkly pigmented foods and beverages--blueberries and coffee as notable examples. Tobacco---either smokeless or cigarettes and cigars--darken tooth enamel as well. Poor oral hygiene worsens these stains. If your teeth and gums are healthy (no gum disease or decay), you're probably a candidate for Philips Zoom! whitening with Dr. Brandon Huang. He'll confirm that with a careful oral examination and the offer you the choice of the in-office or at-home version. Also, you should know that either version of professional whitening protects you from the dental and gingival (gum) sensitivity many people experience with retail whitening systems, says the American Dental Association. So, a trip to see your dentist in Midtown Manhattan is well worth it. Let's say you choose in-office whitening. First, your hygienist will clean and polish your teeth. Then, Dr. Huang will protect your gums and lips with a plastic dam and apply the Philips Zoom! whitening varnish. Depending on the version you choose, the light-activated whitening varnish will produce dramatic results in as little as half an hour. Another in-office version takes 45 minutes. Either way, your teeth will lighten up to eight shades brighter. Results with at-home whitening are similar. You apply the whitening agent via custom-fitted trays. Wearing them for a specified amount of time for up to two weeks, you'll get a whiter smile in the privacy of your own home. Just be careful with your brushing and flossing habits, and see Dr. Huang every six months for exams, cleanings and whitening touch-ups as needed. Avoid tobacco, and reduce your intake of staining dietary choices, too. Philips whitening and you. They can be an unbeatable combination. Why not contact New York Dental Studio in Midtown Manhattan, NY for your personal evaluation by your cosmetic dentist, Dr. Brandon Huang? Call (212) 588-1809. Want a more brilliant smile quickly? We can help make that possible. Whether the ring of wedding bells is in your near future or you just want to give your appearance a little spruce, professional teeth whitening can be a simple, easy and painless way to enhance your smile. If you are tired of trying one whitening product after another and still aren’t getting the results you want, our Midtown Manhattan cosmetic dentist Dr. Brandon Huang has you covered. Professional teeth whitening is far more effective than other teeth whitening options. This is because the medical-grade whitening gel that our Manhattan, NY, dentist uses contains a much higher percentage of the active ingredient (either hydrogen peroxide or carbamide peroxide). This means that the whitening gel doesn’t have to remain on teeth nearly as long as at-home treatment in order to see visible results. When you get Philips Zoom in-office teeth whitening, you could leave the office with a smile that’s several shades whiter in just one session. In fact, most people get the results they’ve been looking for after a single treatment. Of course, those dealing with more stubborn or severe stains may require more than one treatment. This is something we can discuss when you come in for your consultation. Most healthy individuals that aren’t dealing with cavities or active gum disease can be great candidates for professional teeth whitening. If you experience tooth sensitivity let us know beforehand, as whitening treatment could temporarily intensify sensitivity. Luckily, if we know that you deal with this issue we can provide ways to reduce sensitivity during and after your treatment. It’s also important to understand what dental stains professional whitening can and can’t handle. Whitening can best tackle external stains, or stains caused by aging and dark foods and drinks. Whitening can also handle smoking stains, but these stains tend to be more stubborn and might require several whitening sessions. 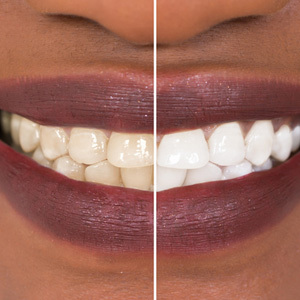 If your teeth look dull and yellow, these are the stains that respond best to whitening. Internal stains (usually blue or grey in color) won’t respond to teeth whitening (but there are other cosmetic options that can hide these discolorations). Also, dental work such as filling and crowns won’t be affected by whitening treatment. Want to find out how professional teeth whitening can revamp and beautify your smile in no time? If so, the next step is to schedule a consultation with us to find out if you are an ideal candidate for whitening. Turn to New York Dental Studio for your smile whitening needs.